Right. First off, I don’t mean ‘epic’ as in huge, expensive, noisy and filled with explosions and fireworks (although it’s totally fine if you want to do that). I mean legendary in the memorable sense. I mean a book launch that will get people talking. As I say in my video, I have two reasons for holding a launch party on publication day. Firstly, I want to say a big thank you to everyone who helped me get to this stage. We’ve all got people to thank… not just the professionals (editors, cover designers and so on) but the people who gave up their time and head-space to read through early drafts, comment on book cover concepts and… well, just put up with us being us, throughout the writing process. (I don’t know about you, but I’m not the easiest person to live with when I get interrupted mid-chapter.) It’s nice to give something back to all those people, whether it’s a cup of tea and biscuit or an open bar. Secondly, you need to make some noise about the fact that your book is out. Hopefully you have various ways of doing this. Perhaps you have a blog, or a big Twitter following, or you do vodcasts on YouTube… or maybe you use traditional press (which you can find out more about in my post on Getting Press Coverage). I recommend using multiple channels to get the word out, including holding some form of event to celebrate publication. An event generates photos, videos, quotes that can be used in the press… and most of all, word of mouth. Even if there are just ten people in attendance, if they each go away clutching a copy of your book and they each ten people about the event… well, you get the idea. Word spreads. The morning after, the hard work begins. Along with any other post-launch marketing you’ve got planned, you need to follow up with everyone who came along – friends, family, strangers – and if there were press in attendance, send out a pre-written press release along with photos, to make the job of writing about the launch do really easy. A book launch isn’t the only way of creating a buzz, but it’s a start. Whether you’re hosting a five-person cuppa or a red carpet event, it should be a lot of fun and it’s a great way of saying thank you to those kind people who helped you along the way. Good luck! ‘When’s the film out?’ ask school kids, when I show them the trailer for my latest novel, Feral Youth. This is a fair question, as it looks like a film trailer. That’s deliberate. I wanted to bring the book to life in a visual form, which meant thinking like a filmmaker. I should clarify: You don’t need to make a trailer. It can be a time-consuming project and if you think your time is better spent getting on with writing the next book, then that’s what you should do. But if you think your readers are hanging out on YouTube, it’s worth thinking about. Similarly, if you’re thinking of selling the film rights down the line, the trailer can serve as a calling card. For non-fiction books, trailers work surprisingly well, especially if combined with snippets straight from the expert on the subject (i.e. you). Thinking like a filmmaker is actually more complex than it sounds. As I say in my video, there are three roles you need to fill: writer, director and producer. You might be fortunate enough to run into someone who actually works in film, who might fill one or more of these roles, but if not, it’s perfectly possible to do all three jobs yourself – just make sure you give yourself time. The first job is to write the script. Even if your trailer involves no dialogue, it still needs a script to describe the locations and give stage directions to the actors. Check out IMSDB if you’ve never seen a script before. For a 90 second trailer, the script should only be a couple of pages long. With your script written, you need to get your producer’s hat on. The role of a producer is to sort out the cast, crew, locations, props, release forms, shoot details and er, budget. I spent about £200 on room hire and the cast’s expenses. I sourced my cast and some of my crew from Casting Call Pro, Star Now and a local theatre for my youth roles. There are lots of great actors out there who will work on your project for free if they believe it offers them something compelling for their show-reel. Stay legal. You can’t just grab any old soundtrack or music from the internet. I commissioned a musician friend to write and record the music for the Feral Youth trailer. You could source it from Soundcloud, but make sure you have the originator’s permission. It’s a lot of hard work, but it’s also a lot of fun – and you never know where it might lead. As well as the obvious promotional benefits of a book trailer (which, for me, has proved invaluable when touring schools), you might find that the cast and crew play an important role in spreading the word about your book. Off the back of my trailer, the lead actor ended up recording the Feral Youth audiobook and another member of the cast has performed a series of his own original songs based on the book. Most excitingly of all, the film adaptation is now in progress – so you never know. If you decide that a book trailer isn’t for you, then perhaps my next post on Holding an Epic Book Launch will be more up your street. No matter how small, you need to do something to tell the world your book is coming out. Until next time – good luck! ‘What’s the best way of getting people to know about my book?’ asked an author, at the end of a talk I recently gave on marketing. There is no ‘best’ way. Every book is different, and what works for one author may not work for another. If you write in a particular genre, for example romance or sci-fi, then maybe the best form of marketing is simply to write more books and make sure they’re set up correctly on Amazon and other retail sites. Personally, I find that traditional press coverage is a good way of marketing my books, because despite being fictional, they are all based on a real-world issues that I care deeply about (sexism in the city, fame culture, lads’ mags, disenfranchised youth, the London Riots and so on), so I comment on these issues in the national press, with the byline ‘Polly Courtney, author of …’. If your book also touches on real-world issues, or if you have an interesting back story yourself, then this technique might also work for you. If you write about zombies in outer space, it might be less relevant. As I say in my video, the first and most important stage of getting press coverage is asking the question: Who’s my book for? Please, don’t say ‘everybody’; it’s neither helpful nor true. You need to think really hard about who your readers might be – I mean those people who would pick up your book before any other, the ones who will tell all their friends about it. I mean your advocates. Perhaps it’s a demographic group, based on the characters you’ve written about. (For Feral Youth, some of my readers were young adults, as the protagonist is a 15-year-old girl.) Or maybe it’s a group with a shared common interest that’s aligned to the themes in your book: vegetable growers, skydivers, heavy metal fans… or maybe it’s an attitudinal group: liberals, right-wing types. Once you’ve identified your target readers, think about what type of media they consume. Are they online all day, or out in the garden listening to Radio 2? Do they read The Guardian or do they skim Twitter for news on their phone? What do they watch? Note down every single programme, channel, publication, event and website you think they might like, then dig around for the contact details of the producers, editors and curators. This will take time, so set aside a few hours for searching. Here’s the most common mistake people make when they publish a book: They think that this is news. It’s not. There are 100,000 titles published each year in the UK. That’s an average of 275 books launched every day. Even the news desk of your local newspaper probably gets bombarded with ten press releases a week, saying ‘Local author launches book’. This is not a story. Your ‘angle’ might be the story behind the book – the real-life events that led you to write it in the first place. Were you in the army? Did you work in a crèche? Or it might be the way you wrote it. Did you scribble it down in your lunch hour, or type it into your phone? My biggest success in this respect was the ‘inside story’ I wrote for the Observer back in 2006 about my less-than-glamorous experiences in the square mile, entitled My high-flying City job was not worth a life of misery. There’s usually something that makes your story uniquely interesting. By the way, all of this thinking should happen long before you publish. Ideally, start to plan your marketing six months before publication. This may sound like overkill, but if you’re planning to approach print publications, you have to work with their timelines. Glossy magazines have a three-month lead-time and if you intend for people to read the book, you’ll need to send out Advance Review Copies well in advance. The other reason you need to plan in advance is that ideally, your ‘angle’ should tie into another news story. Journalists are pack animals; they only cover a story if there’s a ‘buzz’ around the subject already. If you’ve written a book about alternative methods of parenting, it won’t make the national news – unless, for example, Victoria Beckham makes a statement about motherhood. This is your time to strike. You can set up a Google News Alert to tell you when your subject hits the headlines. When you make your approaches, be professional. Use the journalist’s name, not ‘Sir/Madam’. Be succinct and state briefly who you are, what you intend to write and why you are qualified to write it. Check out the example email I use in my video. Oh and don’t harass them if you don’t get a reply! They receive hundreds of emails every day. Press coverage is just one way of generating awareness of your book. Other ways include Making a Book Trailer (the subject of my next post) and Holding an Epic Book Launch (the one after that). Until then… good luck with that marketing plan! First off, a confession: I didn’t do this for my first novel. Bizarrely, it hit number 2 on Amazon anyway, due to various pieces of press coverage (which I’ll talk about in my Getting Press Coverage post), but I can’t help wondering whether it might have made it to the top-spot if I’d known then what I know now about cover design. As I say in my video, authors should not design their own book covers. There are no exceptions. Even if you’re a designer by trade, you should get a fresh pair of eyes on the project – a designer friend, perhaps – if you can’t afford the £500-£1,000 it’ll cost you to get a professional to design the full wrap-around cover and thumbnail. Hopefully I’ve convinced you to collaborate with a book cover designer. So… where will you find such a person? Well, one way is to wander round your nearest book store (or Amazon, if you prefer things virtual) and pick out a few designs you like the look of. Turn the book over (or click to expand the thumbnail) and you’ll see the name and/or website of the designer, somewhere near the barcode. Beware: Some designers won’t take on independent commissions and some might be out of your price range, but if you dig around, you should find someone suitable. Alternatively, there are lots of marketplace websites, this being one of them, which aim to match authors with service providers such as cover designers. Make sure you get genuine testimonials from previous clients and of course, only go with a designer who has worked on books of a similar style or genre. If someone has spent their life designing sci-fi novel jackets, it’s unlikely to be a good match for a romance writer. Getting the right designer is the hardest and most important part. Once you’ve done this, you need to get him or her to understand your book and the vision you have for it. In an ideal world, your designer would read the book, but at the very least, sit down and talk it through. Show him or her any examples of books in a similar style and share any thoughts you have on colours, themes, fonts etc. Don’t be too prescriptive. The designer should have the freedom to come up with ideas! As you’ll see in the video, coming up with the perfect design is an iterative process. You will hopefully start with a few different options, then narrow it down to one core concept, which you can collaboratively hone until you have the perfect layout, colours, fonts, spacing and so on. One of the great things about self-publishing is that you can liaise directly with your designer, rather than being at the mercy of a committee of marketers, editors and other people who haven’t read your book. Test out your concepts! 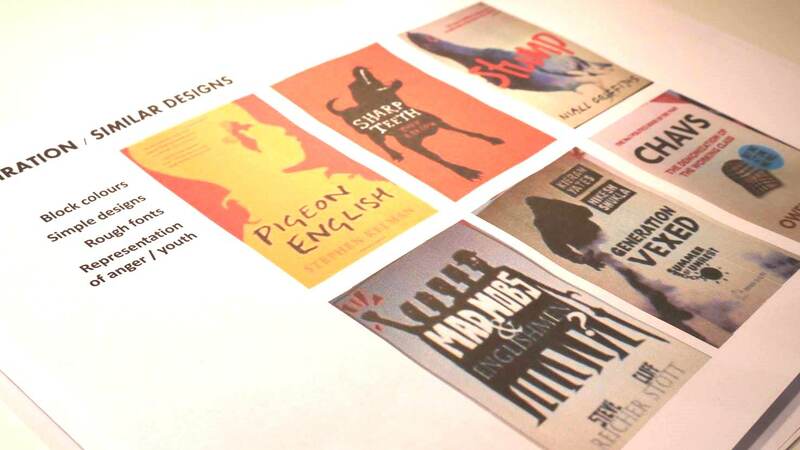 This is a great way of getting potential readers to engage with your project ahead of publication. I often put the shortlist up on my Facebook page for fans to compare. You’d be amazed at how differently people perceive the designs and you might find that the artwork is giving off entirely the wrong vibes. It’s better to learn this now than when the Amazon reviewers are complaining about being misled. As I say in my video, it’s only when you have the perfect front cover (which needs to work as a small thumbnail as well as at scale) that your designer will work on the full wrap-around cover. For this, you’ll need your back-of-book ‘blurb’, which I’ll talk about in my next post, Publishing Your Book. In reality, you’ll probably do all these things simultaneously, working with your editor(s) to produce your final draft, collaborating with your designer to get the perfect cover, agreeing on your publishing and distribution while planning your marketing. It’s not as arduous as it sounds – promise! Next time I’ll be talking about the mechanics of publishing, i.e. getting your book on the shelves, both physical and virtual. Until then… good luck! OK. Deep breath. Here’s the thing. 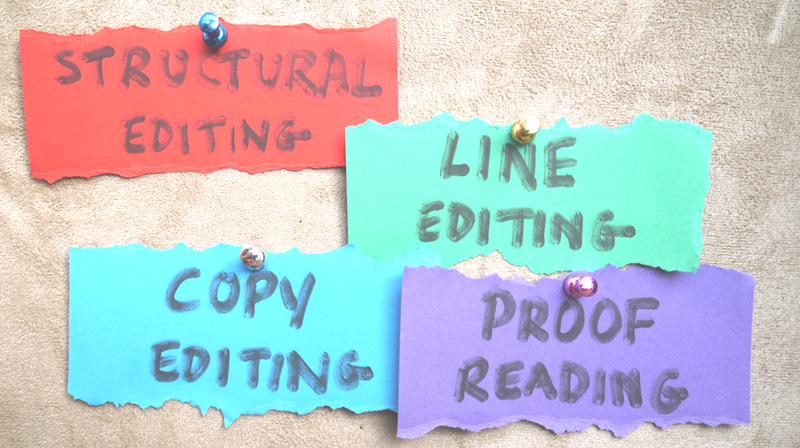 Editing is about so much more than just grammar and typos. As I say in my video, there are four stages to editing and you should do them in this order, because there’s no point in getting the details right if you then go on to change the entire premise of the book. Structural editing is what most writers find the hardest, because it involves killing your darlings – you know, those characters you put in just because they reminded you of those people you met on the train that time? – and it involves turning the whole narrative inside-out, twisting and flexing it until it ends up in a completely different order or style. My first novel was a non-fiction book before an astute editor laid eyes on it. With my latest, I was merrily writing the novel from two different perspectives in alternating chapters until my editor – fortunately after only the first ten thousand words – pointed out that I didn’t need the second character’s voice. I literally scrapped every other chapter. You need a professional editor. This is where to spend your budget – this and cover design. Expect to pay around £5 per thousand words for a good editor, although if you’re using a friend [who is also a professional editor! ], you might be able to negotiate mates’ rates. I open my manuscript up to a trusted set of readers sourced from Twitter and Facebook at this point, to build on the suggestions made by my editor. The result is surprisingly non-conflicting. I would never rely on this alone, however. Professional editors exist for a reason. Oh and you absolutely cannot do this part yourself. Sure, you can (and should) re-draft your book a number of times until you’re really happy with it, but it’s not perfect yet – believe me. Copy editing is about the details: grammar, spelling, consistency, timelines. If your book takes place over a year, or a summer, or even a day, then make sure everything that happens is in the right order, with appropriate references. Don’t talk about cherry blossom in winter, or kids in school uniform in August. Again, it’s best if you can get a fresh pair of eyes on your manuscript, as your editor (and certainly you) will just read what you expect to see on the page. Proof reading is the final stage and for me, this is where the second set of crowd-sourced reader volunteers comes in. You’d be amazed at how many people want to get their hands on a copy of your book ahead of publication. Some people are ‘big picture’ types, so set them to work on the structural editing, but proof readers need to be irritatingly observant – like the people who go around correcting the grammar on shop signs. Once your manuscript has been through all four stages, congratulations! You have your final draft. Next time, I’ll be talking about Getting an Awesome Cover Design, which is the next step in getting your book on the shelves. The trouble with self-publishing is that it’s very easy to do badly. I’m talking about those books that have four typos on the first page; the ones with the amateurish cover designs. You know: the books you put down after half a chapter because the main character is driving you mad. I’m talking about those books that get held up by publishers as shining examples of why they still need to exist. Well, yes and no. Publishers have always provided a filter between the vast jumble of words out there and the bookshelves our readers peruse – a filter that may or may not be based on quality, depending on your point of view. Either way, they don’t have to be the only ones policing the literary waters. Those of us who do choose to bypass the publishers – for whatever reason – should impose our own quality filters, out of respect for our readers and our fellow indie authors. Nobody wants to be part of an industry that is perceived as shoddy. For me, self-publishing is about doing everything a traditional publisher does, but doing it better. This means getting your book ripped apart by an editor, who will leave you to put it back together again. It means getting a professional designer to work on the book cover – even if you know your way around Photoshop. It means working out your best options for printing and/or ebook and executing on a well thought-through distribution plan, setting prices that work for you and your readers. It means marketing the hell out of your book in whatever ways make sense, based on your personality, your time, your budget and the type of readers you think you’ll attract. Oh, and it also means laying on an epic book launch. Don’t worry; I’ve spent nearly ten years making mistakes so that you don’t have to (if you read this blog series, that is). I muddled my way to the number 2 spot on Amazon back in 2006, which got me a book deal with HarperCollins. There, I learnt a lot about what works – and what doesn’t. I’ve since returned to self-publishing for my latest work, Feral Youth, which has offered me more control over how my books are branded and enabled me to put into practice everything I’ve learnt. It turns out, traditional publishers don’t do everything in the most optimal way. They’re big, which means they’re not nimble. If you want to run a short price promotion, forget it; they’ll take six months to get sign-off. If you think all your marketing will be taken care of when you’re with the big boys, you’re sadly mistaken. It would be nice if we still lived in those times, but these days you’re expected to handle all the promotion yourself, using your initiatives and your ‘platform’. Sure, the publisher takes care of your book cover design (and in my case, the title too), which can be a blessing and a curse. But even in the editing stage, although publishers use professionals, they only ever get one set of eyes on the manuscript at any one time. Books are subjective things… your readers might not think like your editor does. Each post has an accompanying video, which shows examples of the advice in action – often based on my own experiences publishing my latest novel, Feral Youth. Although this series won’t cover everything you need to know about self-publishing professionally, it touches on the parts that matter most to me. One big tip, before we get stuck in: Collaborate. As self-publishers, we don’t need to do everything ourselves. In fact, it’s a really bad idea to try and do everything ourselves. We head up the publishing house, which means we have the control, but we consult with experts to get things done properly. Right?